Adolescent Neuroblastoma of Lower Limb. ACPM Dental College Dhule, Maharashtra. Abstract: Neuroblastoma is an embryonic tumour of neural crest origin, commonly seen in children with upper abdomen involvement. Rarely neuroblastomas present in adolescents and adults involving lower limb. Histopathologically neuroblastoma of lower limb can be confused with other small round cell tumour especially with Ewing's sarcoma and rhabdomyosarcoma. A 16 year old male presented with 15x11cm swelling, pain and multiple discharging sinuses of right leg since 4 months. Routine haematological and biochemical analysis were within normal limits. Radiology of right leg showed large soft tissue swelling encompassing the pathological fracture of tibia and bowing of fibula. Fine needle aspiration of the swelling revealed malignant small round cell tumour. 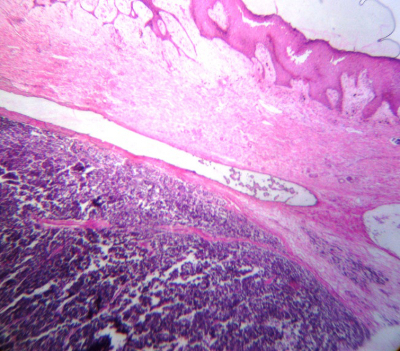 Histopathology revealed poorly differentiated neuroblastoma of lower limb. The immunohistochemistry of Synaptophysin and Chromogranin were positive and CD 99 was negative. Neuroblastoma diagnosed at unusual site with uncommon age has poor prognosis. Hence, one must keep in mind the differential diagnosis of neuroblastoma as one of the differential diagnosis in evaluating the soft tissue tumours of lower limb. Here we report a case of neuroblastoma of lower limb in an adolescent age group which is uncommon for its site and age in the patient which clinically and radiologically mimicked chronic osteomyelitis. Later the diagnosis of neuroblastoma of lower limb was made with the help of fine needle aspiration cytology, histomorphology and immunohistochemistry. A 16 years old male patient presented to an Orthopaedician with history of large soft tissue swelling, pain and foul smelling discharging sinuses of right lower leg since 4 months. Patient had history of anorexia and weight loss of about 10 kgs since 6 months. Past history of similar complaints of swelling, pain and foul smelling discharging sinuses was present 6 months back where the clinical and radiological findings mimicking chronic osteomylitis. On general examination pallor was present. Systemic examination were within normal limits. Local examination revealed 15x11cm swelling, firm to hard circumscribing the posterior aspect of midshaft of tibia having pathological fracture, with multiple reddish foul smelling discharging sinuses on to the scarred skin. Routine haematological investigation showed low haemoglobin, leucocytosis with raised erythrocyte sedimentation rate. Biochemical parameters were within normal limits. Radiology of right lower leg anteroposterior and lateral view showed progressive destruction with pathological fracture of tibia with large mass in the calf not attached to bone and fibula showed sclerosis, osteolysis and bowing. (Figure 1) USG abdomen revealed paraarotic lymphadenopathy with multiple hyperechoic masses in between the normal hepatic parenchyma suggestive of secondaries in the liver. Fine Needle Aspiration Cytology (FNAC) of right lower leg swelling was positive for malignant cells suggestive of malignant small round cell tumour. 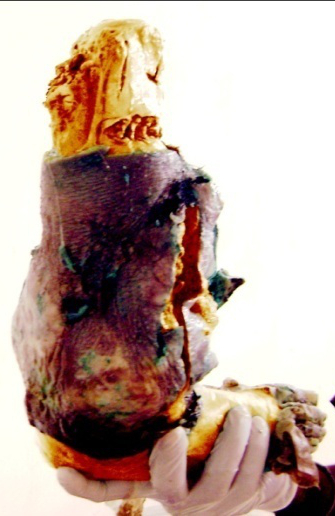 In view of malignant neoplasm, pathological fracture, chronic discharging sinuses of right leg patient underwent right knee disarticulation and the specimen was sent for pathological examination. Gross findings: Disarticulated right knee measured 35 cms in length with the tumour mass measured 13x10cm, firm to hard, encompassing the fracture area of tibia and fibula displacing calf muscles not attached to bone (Figure 2) with multiple discharging sinuses on to the scarred skin. The tumour mass on cut section showed fleshy appearance with large lobulated grayish white tumour mass with areas of haemorrhage and necrosis. 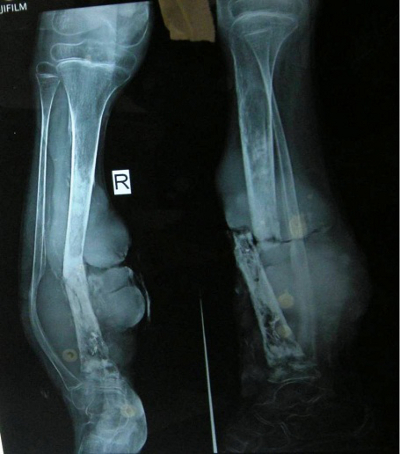 Figure 1: Radiology of right leg AP and Lateral view showing progressive destruction with pathological fracture of tibia with large mass in the calf not attached to bone and fibula showing sclerosis, osteolysis and bowing. Figure 2: The tumour mass encompassing the fracture area of tibia and fibula displacing the calf muscles. Histopathology: Serial sections of the tumour mass showed tumour cells arranged in lobules, sheets and islands of small round tightly packed cells. Tumour cells were uniform, round in shape with round to oval nuclei having granular chromatin with indistinct cytoplasm. The islands of tumour cells were separated from each other by variable background, fibrovascular stroma and abundant eosinophilic neurofibrillary material of neuroblastoma which is a striking feature. Tumour cells were arranged in rosettes suggesting features of Flexner as well as Homer-Wright rosettes with extensive tumour tissue infiltrating into the surrounding tissues (Figures 3 and 4). Special stain like Periodic Acid Schiff was negative. 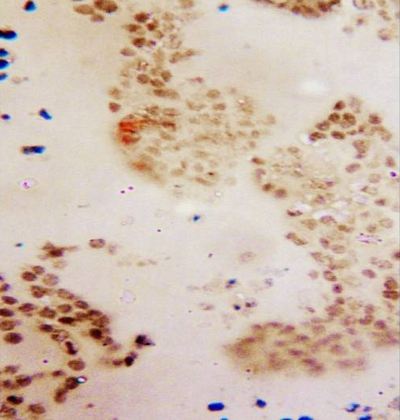 Histopathological diagnosis of poorly differentiated neuroblastoma of lower limb was made. Immunohistochemical analysis revealed focal positivity for synaptophysin and Chromogranin and CD 99 was negative. 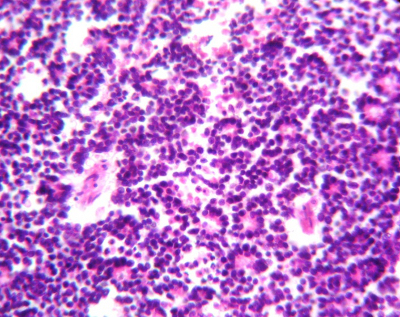 (Figures 5A, 5B and 5C respectively) which confirmed the diagnosis of neuroblastoma. In view of involvement of lymph nodes, liver, skin, patient was grouped under the stage 4 neuroblastoma and was immediately put on chemotherapy and radiotherapy. In follow up patient developed bilateral inguinal lymphadenopathy with chest pain and breathlessness. FNAC of inguinal lymphnode and chest x-ray showed metastatic tumour deposits in lymph node and lung parenchyma respectively. Six weeks later patient expired. Neuroblastomas in adolescent account for <5% (2) and around <1% of all soft tissue sarcoma of lower limb. (5) Neuroblastoma involves 3 classical histopathological types by differentiation and maturation. These include the neuroblastoma, ganglioneuroblastoma and ganglioneuroma tumors. In most cases of neuroblastomas, have a nonestablished etiology, sometimes environmental factors also appear to be involved. The diagnosis of neuroblastoma in adolescent and adult is very difficult as it includes various differential diagnosis like Rabdomyosarcoma, Ewing�s sarcoma, Non Hodgkin�s Lymphoma, Small cell carcinoma, Nephroblastoma. The most diagnostic feature on light microscopy of neuroblastoma is the presence of rosettes, background showing eosinophilic neurofibrillary material and ganglion cell differentiation. The definitive diagnose of neuroblastoma by fine needle aspiration cytology alone is very difficult unless there are Homer-Wright rosettes and neurofibrillary material. Hence combined cytological and histomorphological features are considered in the diagnosis of either the primary or metastatic neuroblastoma. Only one reference has been found relating to FNAC diagnosis in an adult. (6) Compared to children, neuroblastomas occurring in adults and adolescents usually present early in advanced stage and with metastasis (7), as seen in our case report. The treatment of neuroblastoma is surgery, chemotherapy (include alkylating agents like cyclophosphamide/ifosfamide, platinum-based agents like cisplatin/carboplatin, etoposide, adriamycin and vinca-alkaloids) or radiotherapy, stem cell transplantation, immunotherapy (monoclonal antibodies - anti �GD2), radioisotope iodine 131- MIBG and NYMC amplification. (9) The prognosis of the patients with neuroblastoma depends on numerous variables; the most important of them are age of the patient at diagnosis and the stage of the tumor, DNA ploidy, histology, and chromosome 1p, 11q, 17g aberration. (10) Two important favourable prognostic features of neuroblastoma are the age and the stage of the tumour at the time of diagnosis. Our case report illustrates neuroblastoma as an extremely rare neoplasm in adolescents with rare site of lower limb presentation. Neuroblastoma diagnosed in adolescents has got poor prognosis as it presents with advanced stage at the time of the presentation. Neuroblastoma in the lower limb is often misdiagnosed as chronic osteomyelitis, but the actual nature of the disease becomes apparent after a considerable period of time. Hence, combined investigations like radiodiagnosis, ultrasound, fine needle aspiration, histomorphology and immunohistochemistry are useful in the accurate diagnosis of neuroblastoma. Hence one should include neuroblastoma as one of the differential diagnosis of small round cell tumours even at rare site and age of presentation. As there are newer modalities of early diagnostic tests and well advanced treatments that increase the survival rate of the patient, high index of suspicion is needed in early diagnosis and prompt intervention to improve prognosis and reduce the morbidity. McLean TW, Iskandar SS, Shimada H, Hall MC. 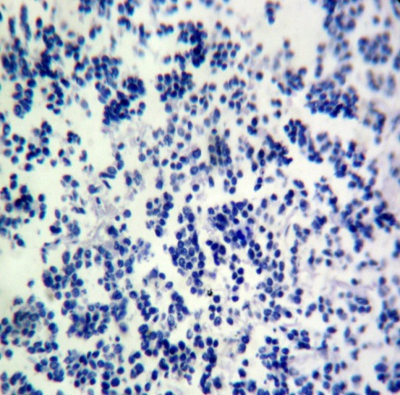 Neuroblastoma in an adult. Urology. 2004;64:1232. Rubie H, Hartmann O, Michon J, et al. N-Myc gene amplification is a major prognostic factor in localized neuroblastoma: results of the French NBL 90 study. Neuroblastoma Study Group of the Societe Francaise d�Oncologie Pediatrique. J Clin Oncol. 1997;15:1171�1182. Armstrong EA, Harwood-Nash DC, Ritz CR, et al. CT of neuroblastomas and ganglioneuromas in children. AJR. 1982;139:571�576. Mackay B, Luna M A, Butler JJ. 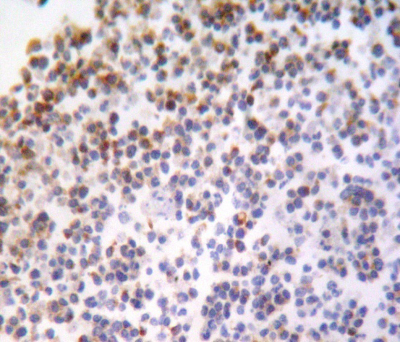 Adult Neuroblastoma. Cancer 1976;37:1334. Feldman PS, Covell JL, Silverman JF et al. The diagnosis of neuroblastoma by fine needle aspiration cytology(Abstract). Acta Cytol 1985;29:950. Conte M, De Bernardi B, Milanaccio C, Michelazzi A, Rizzo A, Montobbio G, et al. Malignant neuroblastic tumors in adolescents. Cancer Lett. 2005;228:271�274. Conte M, Parodi S, De Bernardi B, Milanaccio C, Mazzocco K, Angelini P, et al. Neuroblastoma in adolescents: the Italian experience. Cancer. 2006;106:1409�1417. Navid F, Armstrong M, Barfield RC. Immune therapies for neuroblastoma. Cancer Biol Ther. 2009;8:874�882. Esiashvili N, Goodman M, Ward K, Marcus RB Jr, Johnstone PA. Neuroblastoma in adults: incidence and survival analysis based on SEER data. Pediatr Blood Cancer. 2007;49:41-46.